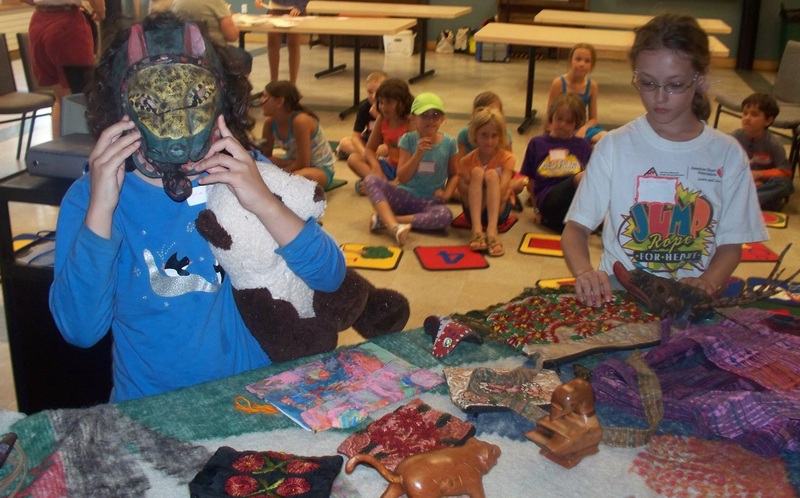 Kids Share Workshops visited the Brown Public Library in Northfield, Vermont July, 14. (Please see our slide show below) The summer reading program at the Brown Public Library is traveling around the world by learning about cultures. The children visited Guatemala with Kristina, founder of Kids Share Workshops. After returning from teaching in Guatemala Kristina shared a presentation and tissue art demonstration. Kids Share Workshops taught an after school program at PanaKids located in Panajachel, Guatemala for the month of June. Beautiful fabrics, purses, toys, currency and masks were shared. The children learned about the Mayan children living in the Lake Atitlan region. Photos were shown from a three day festivity of the Procession of the Saints. The children loved seeing the beautiful costumes. Kristina’s daughter Phoebe shared the Kids Share Song which all the children loved to sing. Afterwards everyone gathered around to learn about tissue art painting. Kristina explained how the children in Guatemala took their tissue art and decorated recycled containers and journals. She encouraged the children to think about decorating their own recycled containers with their artwork. A special thanks to Nancy Munno, Youth Services Librarian and all the volunteers who helped make the 1.5 hour program a success! Thank you for your interest and support in sharing cultures with children! will you podcast or otherwise your KSW training Seattle..